Iggy Pop will be at the Tribeca Barnes & Noble (97 Warren St) tonight (10/13) at 7pm. He’s speaking with Robert Matheu, who just wrote The Stooges: The Authorized and Illustrated Story, about the book and his life. Entry is first come, first served. On September 11th and 12th, Iggy Pop joined Marc Ribot, Ceramic Dog, and singer Tine Kindermann at this year’s Century of Song Festival (part of Germany’s Ruhr Triennale), which was curated by Ribot. The set list from the first of those gigs (posted below) covers a broad range of material, from “Les feuilles de morte” (Autumn Leaves) off Pop’s new album to German folk song “Schwesterlein” (Little Sister) to “I Wanna Be Your Dog” and “Mass Production” (the latter from 1977’s The Idiot). Video clips from that set are posted below. Marc Ribot’s Ceramic Dog are touring Europe through October. Iggy Pop and the Stooges are scheduled to play Rio in November and perform Raw Power in full at ATP’s Don’t Look Back shows on May 2nd and 3rd at London’s Hammersmith Apollo. Also on the ATP bill are Suicide, who’ll be playing their first album like they did at ATP NY. Tickets are on sale now. 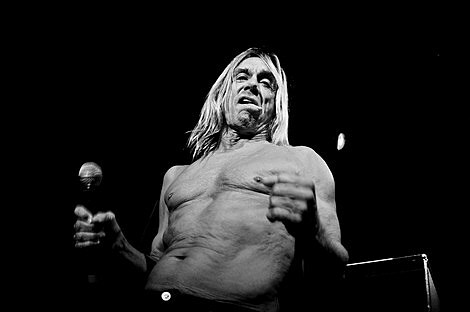 Iggy Pop, as well as Pavement (who are curating the other ATP UK weekend in May), are both rumored to be in the running for ATP NY in 2010.